Hundreds of thousands of older people in England who need social care are not getting any support from the state or private sector, campaigners say. Age UK says 800,000 people are excluded from the system - and the figure is set to top one million within four years. It said budgets had hardly risen in recent years even before the squeeze, despite the ageing population. The charity renewed its call for an overhaul of the system, something ministers are looking at. Social care in England is means-tested, which means those with savings of over £23,250 are excluded. But councils have also been making it more difficult for those who do meet the income threshold to get care, by tightening the eligibility criteria. Six years ago, half of councils provided support to people with moderate needs, but that figure has now dropped to 18%. Media captionMichelle Mitchell, Age UK: "People are suffering in silence"
It means only 1.2 million are getting formal care either at home or in a care home - although some of these are being forced to pay for the services themselves anyway, as they exceed the income cap. The report - based on previously published data by government bodies and independent researchers - pointed out while the NHS had received significant budget rises in recent years, social care increases had stalled. Once inflation is taken into account, funding has only been rising by 0.1% a year since 2004 - equivalent to £43m. By comparison, the NHS budget rose by £25bn. Michelle Mitchell, charity director of Age UK, said: "The figures we have uncovered beggar belief. Care and support in England has reached breaking point, putting older people at risk and their families under intolerable strain." The charity has been calling for means-testing to be scrapped so that a universal system could be created, guaranteeing everyone a certain level of support if needed. The government has set up a review of the system and is expected to publish plans for reform later this year. 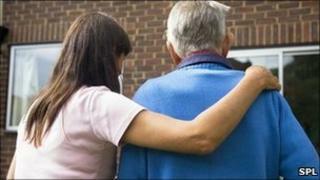 Other parts of the UK are also looking at how they provide social care amid mounting problems. A Department of Health spokesman said: "The government recognises the urgent need to reform the social care system - an ageing population and rising expectations make the current system completely unsustainable." He added the plans to be put forward later this year would "put in place a lasting and fair settlement for social care".